It’s Christian bumper sticker month. 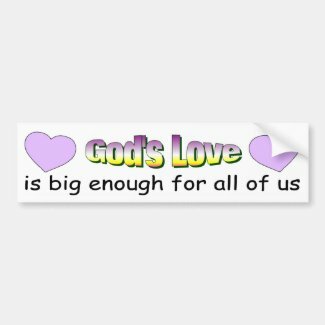 Today’s sticker saying “God’s love is big enough for all of us” Design by Diligent Heart. This entry was posted in Christian Gift Ideas and tagged bible verse stickers, bumper stickers about god, christian bumper stickers, christian decals, diligent heart, fun christian quotes, fun christian sayings, gods love stickers, heart bumper stickers, religious bumper stickers, stickers with hearts by dili2334. Bookmark the permalink.